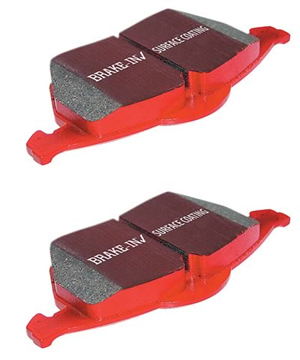 These Redstuff 3000 series ceramic brake pads from EBC are made of heavy-duty material for seriously fast road and track combination use. These are truly impressive, fast road pads for repeated heavy braking. They have good bite for highway driving and have been pounded on race tracks during development. They emit far less dust than semimetallic pads and feature EBC Brake-In surface coating, which conditions the rotor surface and accelerates pad bed-in. TECH TIP: They are capable of withstanding limited track day usage. If you are looking for a track pad, try the Yellowstuff pads.